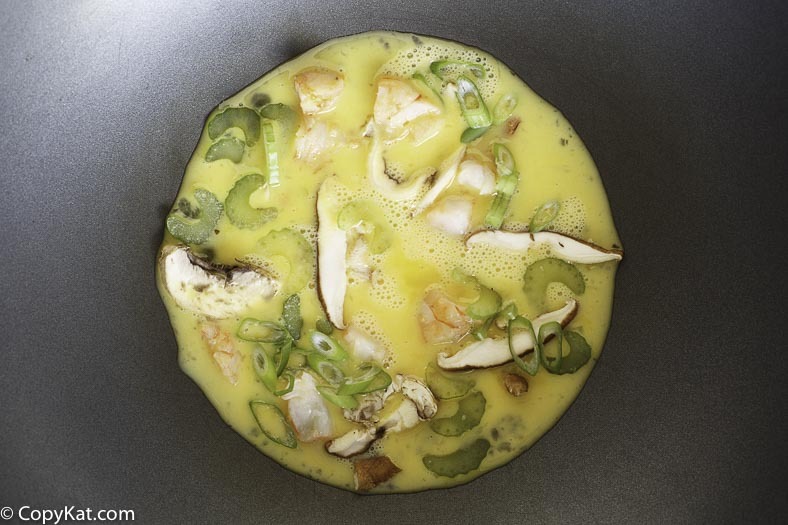 Making Egg Foo Young at home is easier than you might have ever imaged. 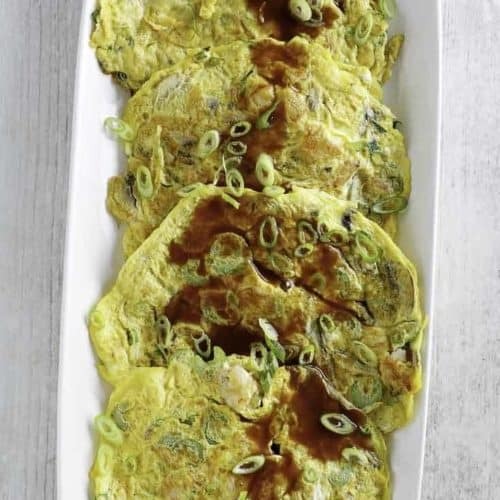 Arm yourself with eggs, some fresh veggies, and your favorite meats, and you will soon be making delicious take-out style egg foo young at home. One of the best parts of making copycat recipes is you get to enjoy some of your favorite Chinese take out recipes like Cream Cheese Wontons, Chinese Spare Ribs, and Panda Express Broccoli Beef. So wanting to grow your take-out food repertoire, let’s add Egg Foo Young to your recipe war chest! 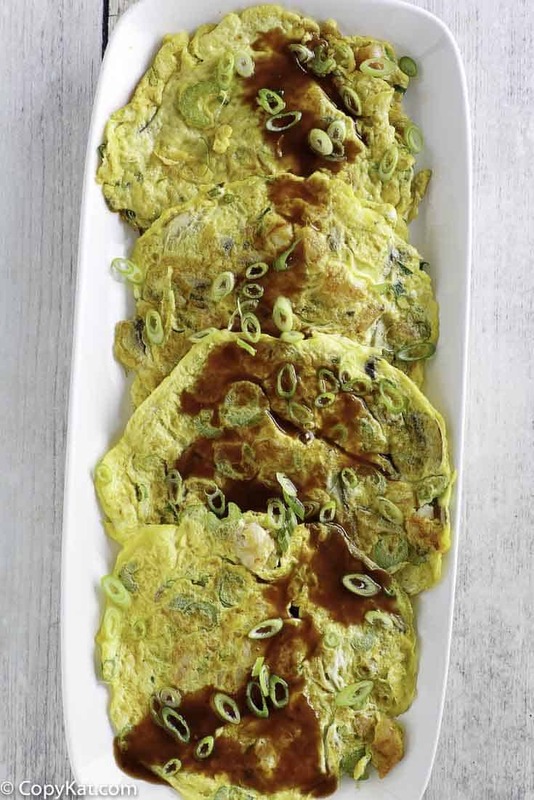 This omelet style of a dish can be found in the Chinese American, Chinese British, and Chinese Indonesian cuisine. Like many dishes, this one has been adapted and changes depending upon where it is served. Interestingly this dish has many different spellings, you might see it on the menu as egg fooyoung, egg fu yung, egg foo yong, or even egg fu yung. What is common is that egg foo young is served with fresh vegetables like bean sprouts, spring onions, mushrooms, cabbage, water chestnuts. Often this is served with meat like Chinese sausage, chicken, shrimp, or pork. So this is the perfect dish because you can adapt it to what you have on hand. In the 1930s as Chinese American food was becoming popular and growing, a rich brown gravy began to be served with the egg foo young. This gravy is rich and full of umami. The gravy served with this recipe is super easy to make. So don’t go without the gravy to go with the egg foo young! To make your dish complete also top off your creation with slices of green onion, and no one will know you didn’t call for take out on this recipe. 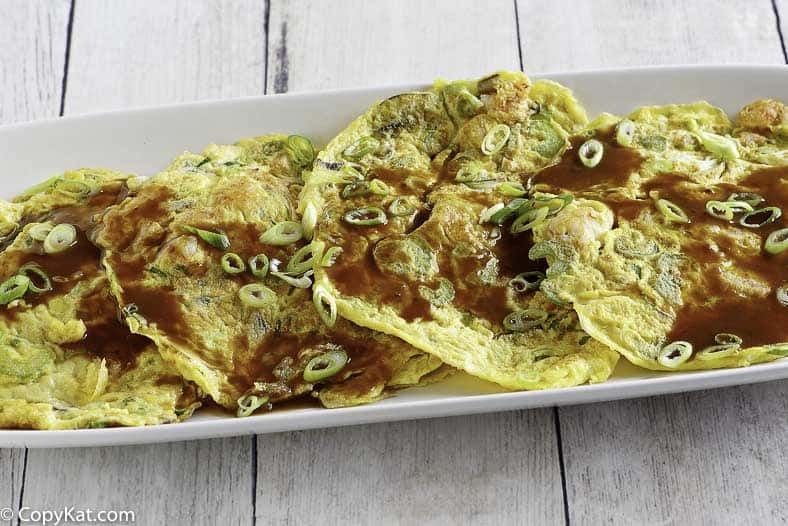 Recreate this famous Chinese American dish at home, Egg Foo Young never tasted so good. 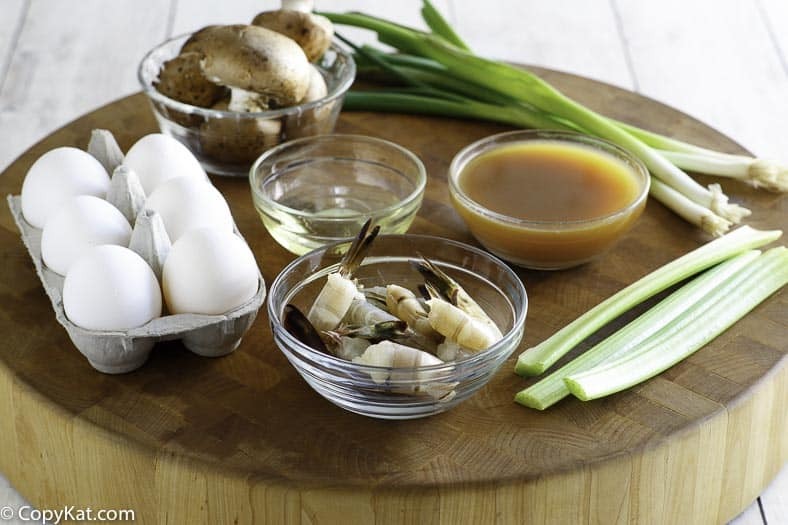 Make the sauce by combining the chicken stock, oyster sauce, sugar, and sauce in a small pan over medium heat. Cook until warm and bubbly. Prepare cornstarch slurry by combining the cornstarch and water together in a small bowl. Stir to combine. Add in the cornstarch slurry and stir until the sauce thickens. Turn off the heat. To make the egg foo young, in a large bowl add the eggs. Beat eggs together until the whites break down completely. In a heated wok add about a tablespoon of vegetable oil into the base. When the oil is hot stir it around coating the sides. Pour about a half cup of the egg foo young batter into the pan. The eggs should bubble up when the batter is poured into the pan. Stir the uncooked eggs gently to the sides of the pan so they cook. The egg foo young will cook for about 2 minutes before you will need to flip the eggs to the other side. Serve with brown gravy and top with green onion slices. What, no bean sprouts? I never heard of such a thing! You are right, I didn’t specifically add them to the recipe. They can be hard to find in some stores, I did note that you can add them in, it was one of my optional ingredients. May I suggest frying these in sesame oil? Deelish! Definitely adding a touch of sesame oil or even toasted sesame oil is a great way to add flavor.